Obama firmly believes in his support of the recent FISA bill that would grant retroactive immunity for telecommunication companies that might have broken the law, Gov. Ed Rendell said on Fox News Sunday. In a video available below, Rendell added that the bill was worth defending as a "huge victory for individual rights" because it mandated court supervision of wiretaps. "He has pledged later on in the Senate to try to strip the immunity position," Rendell said. 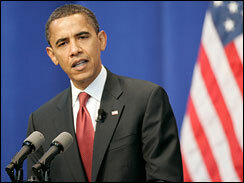 Senator Obama issued a statement defending his decision as a "compromise" soon after Congress passed the measure. “Under this compromise legislation, an important tool in the fight against terrorism will continue, but the President's illegal program of warrantless surveillance will be over," Obama said in the statement. "It does, however, grant retroactive immunity, and I will work in the Senate to remove this provision so that we can seek full accountability for past offenses." The Senator's vote for the the FISA bill marks the first serious break with his "liberal netroots", CBS News reported, ending his honeymoon with progressives who flooded to support him after former Senator John Edwards left the race. WALLACE: On the one example of FISA, several months ago, he said he would lead the filibuster if there was an effort to strip the -- to allow immunity for the telecom companies. Now he's voting for the bill that gives them that immunity. That's a pretty big switch. RENDELL: When you're in the Senate, you have to weigh the entire bill. The bill on FISA was court supervision of wiretaps. That's a huge victory for individual rights in America. Senator Obama believed that was more important, that he had to go along and vote for it even though it didn't have the immunity provision or did have the immunity provision, but he has pledged later on in the Senate to try to strip the immunity position. This video is from Fox's Fox News Sunday, broadcast June 29, 2008.